The Fluke 787 was the first tool to combine a DMM and a loop calibrator to give process technicians double the power in one tool. 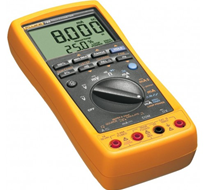 Now it’s even better, the range is extended with the new Fluke 789 – the ultimate loop calibration multimeter. The Fluke 789 has a 24-Volt loop supply reducing the need for taking a separate power supply when doing offline transmitter testing. And with its built-in, selectable 250-Ohm Hart® resistor, it also eliminates the need to carry a separate resistor with you. Now process technicians can do a lot more while carrying a lot less.